The Greenbrier, at White Sulphur Springs, West Virginia, in Greenbrier County, is a spa and luxury resort complex established in connection with the warm mineral waters of White Sulphur Springs. It began to grow as a social center for wealthy Southerners in 1790 after the completion of a Virginian state highway through the area. A group of row houses and a tavern were built near the spring by owner Michael Bowyer and his son-in-law James Calwell in 1809. Private cottages sprang up quickly. Among the largest was a two-story summer White House in the Adams style that was used by presidents John Tyler, Millard Fillmore. and Martin Van Buren. During the Civil War the resort was used by Union and Confederate as a headquarters and a hospital. It reopened as a hotel in 1867. In 1910, the property was purchased by the Chesapeake & Ohio Railway, which hired New York architect Frederick J. Sterner to design the central section of the current Greenbrier hotel. With 250 guest rooms, grand ballrooms, and space for cafes, restaurants, and retail shops, the large Georgian structure maintained the regal grand style of the resort’s heritage. During World War II the federal government purchased the resort complex and used it for a military hospital and internment facility for German and Japanese diplomats. The C&O Railway (later CSX) reacquired the resort in 1946 and had it redecorated by Dorothy Draper. In 1959, during expansion of the hotel, a secret bunker was built as an emergency relocation center for Congress. It was declassified in 1992 and may be seen in public tours. After losing money for several years, the resort was placed into bankruptcy and sold to the James Justice family in 2009. Today, it offers a luxury guest experience along with casino gambling, the Presidents’ Cottage Museum and events such as the Greenbrier Classic PGA golf tournament. The hotel is also a featured location in the Fallout 76 video game. 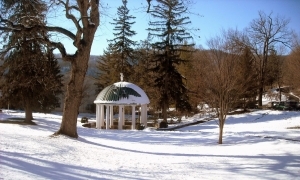 See White Sulphur Springs (WV) Hotels for further information on The Greenbrier and other local hotels.